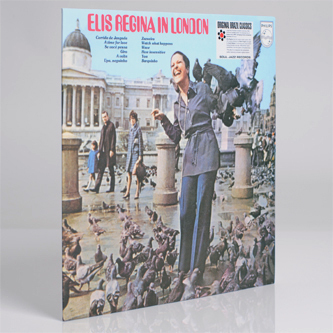 **High-quality bespoke box-edition reproduction of a seminal Brazilian bossa nova album never before released outside Brazil** "Legendary Brazilian vocalist Elis Regina's stunning 1969 landmark album. An amazing, unique and highly successful mix of bossa nova, MPB, swinging funky orchestral grooves and more. 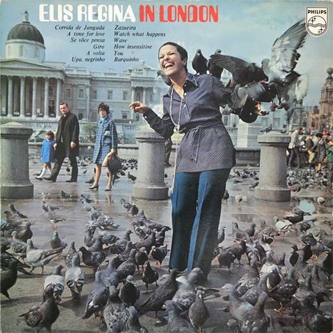 Elis Regina hits the London studio scene, with UK musical direction by Peter Knight (arranger for Scott Walker). 'Elis In London' is a stunning and unique album mixing Brazilian and late 1960s British music sensibilities, from the queen of Brazilian music. Featuring definitive versions of classic tunes such as Edu Lobo's 'Upa Neguinho' as well as songs by Jorge Ben, Tom Jobim and Menescal. Elis Regina is the greatest talent ever to come out of Brazil and this unique album was recorded at the height of her career. Brazilian musician legends Wilson das Neves, Meirelles and Antonio Adolfo alongside an absolutely on fire set of Britain's studio musicians creates one of the most successful meetings of musical worlds." Copyright © 2018 Boomkat Ltd.
We take the security of our website and of your transactions extremely seriously. We encrypt all traffic involving personal data with industry-standard SSL certificates and we are also PCI compliant - meaning that we follow all current data security standards and undergo weekly scans monitoring our security status. Additionally, we do not store any card details at all, all payments are handled using a system of Tokenisation which is an industry-standard method of secure payment handling. When you place an order with us payment is either handled via your Paypal account or if you choose to pay by credit/debit card we create a "Token" with your payment details which is stored by the Bank payment gateway. When you return to make a purchase it basically reactivates the "Token" so no details need to be entered again and those details are not stored by us. Estimated shipping dates are accurate to the best of our knowledge, based on the latest stock information made available to us from the supplier. Available items should ship to you within the time-frame indicated. If there are any unforeseen issues with availability we will notify you immediately. *To qualify for free postage the order must be sent as one package. Therefore, all items must be in stock or you should be happy to wait until all items become available to ship so they can be sent as one package. Downloads and Gift Vouchers do not count towards free shipping. Please note that Pre-Orders do not count towards free shipping as their release dates are liable to fluctuate. If your order contains items that have different estimated shipping dates (for example, ‘available to pre-order’, ‘in stock’, ‘available to ship in 1-3 days’) you will be given an option either to wait for everything to become available to ship in one package, or to ship each item as soon as it becomes available. Stock arrives at the office throughout the day so the stock status of items on the website can change several times a day. Important Note: all items that are not currently displaying as In Stock need to be ordered in from our suppliers and the estimated shipping dates are only an indication of when we expect those items to come into stock. If there are any unforeseen issues with availability we will notify you immediately. At checkout you are able to select a premium packaging option for a fee of £1.50. We pack all of our orders using appropriate packaging, however when you pick this option we use a wider cruciform offering additional protection if you have a particularly heavy-handed postman. 1. First Class Royal Mail - for UK and for International orders: The package will be delivered by your national postal service. Royal Mail sets limits on the weight of packages, so if the order becomes too heavy to ship in one package the order will be split into two or more packages. The packages will be marked accordingly, for example, if an order has to be sent over two packages the packages would be labelled ‘1 of 2’ and ‘2 of 2’. Parcelforce can only ship to PO boxes in certain countries, details can be found once you have made your country selection at checkout. Once you have added items to your crate you can select your country and choose either to send everything in one package or to ship as soon as the items become available. At this point the total given is a guide to the cost and more shipping configurations are available once you have logged in and proceeded to checkout. At the checkout you will still be able to add or take away items from the crate and change/compare your shipping options. Pre-orders are treated as separate packages to items that are either in stock or available to order. If pre-orders share the same release date then they can be ordered and shipped together. However pre-order release dates are liable to change, if you have ordered two pre-orders with the same date to ship together and then one release date gets pushed back, we will ship the available pre-order straight away and the second pre-order as soon as it becomes available with no extra shipping charge. If you choose to ship your order across more than one package you can select the Royal Mail service for one package and Parcelforce courier for the other. * if an individual item weighs more than 2kg and you are outside of the UK the package must be sent via courier as Royal Mail sets a 2kg limit on packages. * Royal Mail covers postage all countries, however Parcelforce is not available in every country. If an order does not arrive, we can issue a replacement package. In the UK we consider a package to be missing after 15 working days. Most international orders are considered missing after 25 working days with the exception of France, South America and Africa - packages to these destinations are considered missing after 60 working days. Before we can issue a replacement, customers must have checked with their local depot/sorting office to see if their package is awaiting pick up. If we think there is an issue with the shipping address, or that packages are being stolen in the post, we reserve the right to refuse future orders to these addresses. We automatically add an insurance supplement to orders over £30. Orders between £30 - £49.99 are charged a 60p insurance supplement. Orders over £50 are charged a £3 insurance supplement. If a package is returned to us because of an incomplete address, or because it was not collected from a local depot, we will have to charge you again in order to re-send it. We will get in touch with you before any package is re-sent. The delivery times below are estimates. A lot depends on the efficiency of your local post service. UK (inc. Northern Ireland): 1 working day except for highlands of Scotland and parts of Scotland, please get in touch for further information. Western Europe: 2-3 working days for most countries but takes longer shipping to Finland, Greece, Italy, Norway, Portugal and Sweden. Eastern Europe: 3-6 working days for most countries but can take up to 7 days for other countries, please get in touch for further information. Please note shipping times can vary within a country depending on the area - for further information please get in touch. Please note that the estimated shipping times above can be affected by circumstances beyond our control such as bad weather, delays at customs, busy times of year etc. If you require further information or assistance then please contact us. If your order contains items that have different estimated shipping dates you will be given an option either to wait for everything to become available to ship in one package, or to ship each item as soon as it becomes available. Stock arrives at the office throughout the day so the stock status of items on the website can change several times a day. We automatically add an insurance supplement to orders over £30. Orders between £30 - £49.99 are charged a 60p insurance supplement. Orders over £50 are charged a £3 insurance supplement. For Visa/Mastercard, the three-digit CVV (Card Verification Value) number is printed on the signature panel on the back of the card immediately after the card's account number.